I am just beginning to understand mine. I have always been helpful and compassionate, but I truly love helping people. If someone were to ask me the most influential woman for me, I would say Oprah. She is so notable that you merely mention her first name, not followed by her last name, and instantly the recognition is there. 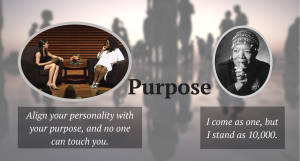 I just finished watching a Stanford student-led Oprah Winfrey interview on Career, Life, and Leadership on YouTube. I would guess I have watched this interview at least ten times. I absolutely love it. On this segment, beyond her life story of where she started and her funny comments, she indicates the source of her successful career progression. She talks about the feeling inside. The gut feeling and how important it is to pay attention to that gut feeling. Unfortunately, it can take many years of experience to recognize and pay attention to that feeling. I have been guided so many times in my career by being prepared for the opportunity to happen. And it does. Maybe not on my timeline but it eventually happens. I take that moment before making a decision and spend a moment in time thinking about the decision. I call that consciousness. To spend moments of time to listen and feel if the decision is right. All of Oprah’s best decisions were made when she was in tune with her intuition. If the decision didn’t feel right, then she knew she would not be in that situation forever. The situation was temporary. She knew that when the time came, the opportunity would show up. Opportunities have presented themselves for me in the same way. Just like Oprah, I have failed, when I overrode that inner voice with my own thoughts. She describes being the only woman in the room full of older white men and how it thrills her. She also obtains satisfaction being the only black person in the room. She mentions the line from Maya Angelou’s poem “Our Grandmothers,” where she says, “I come as one, but I stand as 10,000.” Oprah calls on the 10,000. She draws on the spirit of all the women who paved the way for her. She owns it, and she steps into the room with the heritage of those women that paved the way. She has also spent the time on herself and knows her purpose. She lives and breathes that purpose. Every day she gets out of bed on fire because she knows her purpose. She is a living, breathing example of how to live the highest, most genuine expression of herself. She is here to raise consciousness. Her real contribution is to connect people to themselves. Here, here Oprah. You are succeeding. I am contributing to the planet, and I am awakened and experiencing authentic empowerment. I am aligning my personality with my purpose.